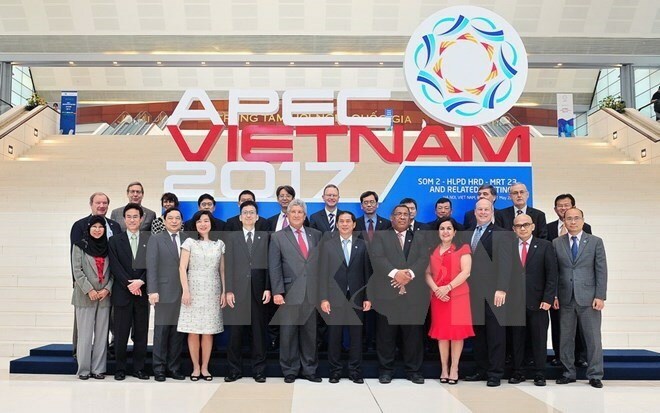 HCM City (VNA) - Around 2,600 delegates from 21 APEC member economies have arrived in Ho Chi Minh City for the third APEC Senior Officials’ Meeting (SOM 3), which begins on August 18. The event, slated to last until the end of the month, will feature 75 meetings, seminars, and dialogues involving four committees and dozens of working groups of the Asia-Pacific Economic Cooperation (APEC). The Transportation Working Group will meet on August 18 for the 10th APEC Port Services Network Meeting. Other meetings on the day include the APEC Network on Anti-Corruption Authorities and Law Enforcement Agencies, the Impact of Government Policy Instruments on Promoting New Energy Vehicles, Customs Best Practices to Identify Illegal Timber and Wood Products, and the workshop on Best Practices in Policies, Regulations and Flexibility for Resilience of Global Value Chains. The APEC 2017 Secretariat has flagged three key activities: the High-level Policy Dialogue on Food Security and Sustainable Agriculture in Response to Climate Change in Can Tho from August 18 to 25, a seminar on Promoting Economic, Financial and Social Inclusion in HCM City on August 28, and a seminar on inclusive growth, which is a Vietnamese initiative and expected to promote the agenda for the 2017 APEC Year. The APEC 2017 SOM Chair is expected to chair the events. The Ministry of Health will chair seven meetings on health-related issues during which relevant strategies and policies in APEC as well as action plans for special working groups will be discussed. Health Minister Nguyen Thi Kim Tien will preside over the seventh High-Level Meeting on Health and Economy slated for August 23 to 28, another key event. The event is expected to help promote Vietnam's initiative on inclusive economic, financial and social development through building a sustainable financial system for public health and a roadmap that provides all people with health services. The meeting is expected to issue a joint declaration and recommendations which will be sent to the APEC Finance Ministers’ Meeting and the APEC Economic Leaders’ Meeting this November in Da Nang. Within the framework of SOM 3, Minister Tien is scheduled to hold bilateral meetings with US Secretary of Health and Human Services Thomas Price and Japanese Senator Keizo Takemin, and meet with representatives of APEC partners and relevant organisations.